2018 was a tumultuous year for privacy: The GDPR went into effect, California passed its Consumer Privacy Act, Equifax revealed the largest consumer data breach to date, and Facebook disclosed separate incidents of data misuse and a massive data breach. Forrester data shows that 79% of US online adults use at least one tool to protect their digital privacy and security. GDPR has changed customers’ ownership of data and how they wish to handle it. This change in ownership has moved the context of data to a customer’s property from that of a business asset. The need of the hour is for businesses to build digital trust with their customers. 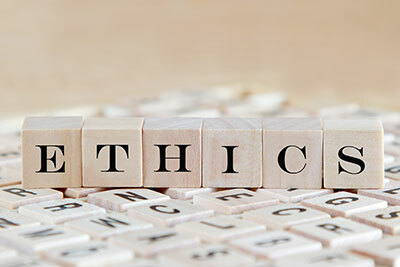 In today’s information age; information ethics and technoethics are key. As such, they are inoculating a more ethical approach to building business models important for organizations. Forrester has stated 2019 as a will-be-year of consumer action with 2018 as having stood for regulatory action. But why Digital Ethics? What of it? 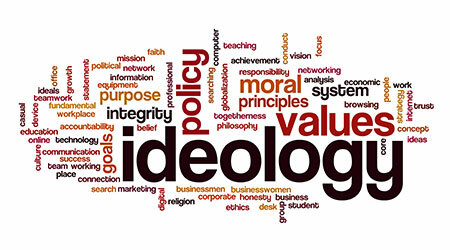 Digital ethics is concerned with the way technology is shaping and will shape our political, social, and moral existence. Digital ethics and privacy are becoming a growing concern for individuals, organizations, and governments. People are increasingly concerned about how their personal information is being used by organizations in both the public and the private sector. 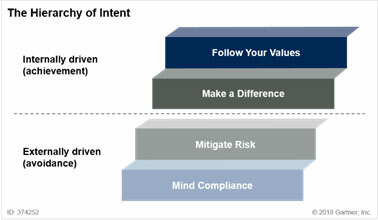 The move from compliance-driven organizations to ethics-driven organizations can be described as the Hierarchy of Intent. Mind compliance:As the lowest level in the hierarchy, minding compliance is externally driven and focused on avoiding issues. Here, enterprises make decisions about the use of technology based on what is allowed. If there is no rule against what is proposed, it is allowed. Mitigating risk: This level focuses on the risk an enterprise is willing to take without harming itself. This includes assessing the risk of harming others and of “getting caught” doing something that leads to public embarrassment and reputational risk. Emerging technologies such as the IoT and AI, along with an explosion of third-party data, exponentially increase both the opportunities and the attack surface for this data. Cambridge Analytica (now insolvent) infamously used data from Facebook to influence voter behavior through microtargeting advertisements. Right to be forgotten (RTBF) legislation exists in many jurisdictions including Europe, South Africa, South Korea, and China. It requires companies to remove data about individuals on request. The right to data portability empowers customers to more easily take their data — and business — elsewhere. Making a difference: Ethical considerations can be used to make a difference for customers, industries or even society at large. For commercial enterprises, this can mean competitive differentiation by creating a value proposition out of ethics. For public-sector institutions, this can mean creating value for citizens based on what they are expecting. What company values do you have? What is your “brand permission”? Consumers expect brands to follow the “do right rule,” which is essentially to follow an ethical standard for all uses of and analytics on data and not cross any lines that would harm them. This requires brands to know where the “line” is, and understand that the line will move, over time. Addressing the Ethical Use of Data(EUoD) in governance policies and procedures will take care of any unintended consequences and helps address data considerations for customers and partners. What is the purpose of my data-driven project? What is the data provenance? Under what privacy promise did the data originate? What was the consumer expectation when it was collected? Was the consumer given meaningful notice and choice? Will the outcome of my data-driven project and impact deliver articulate-able value to all stakeholders, including the consumer, or does it violate a line that may be undefined, but could be discerned against all the facts with good judgment? In the long term, robots may or may not take some or all of our jobs. This might create motivation for people to ‘stretch’ their morals in a vain effort to keep their jobs.